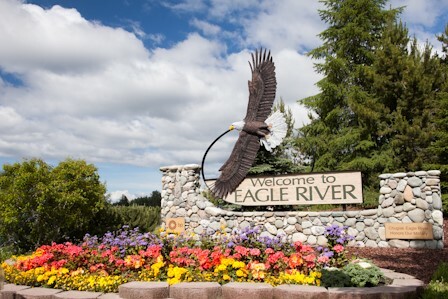 Chief Alex Park delineates the Southern boundary of the Eagle River Business District and features lawn, beautiful gardens, picnic areas and is the site of family picnics and community events. 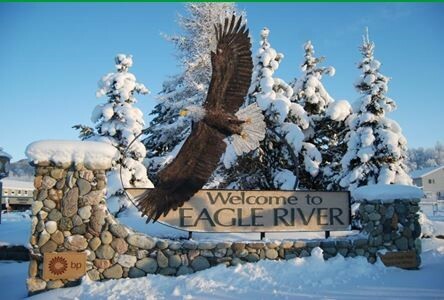 It is also home to our Town Clock and Commemorative Brick Pavilion and our Welcome to Eagle River sign. The Park has been a Chamber project since 1983. This park is entirely supported by the Chamber with generous support from businesses and residents. Funds from the Annual Beautification Tea help raise money to offset the expenses of the park, including insurance, electricity, water and park maintenance fees which may rise every year. Chief Alex Park has an active group committee who are invested in the restoration, maintenance and long-term plans of the park. There are a number of individuals and groups who volunteer their time to service the park. Volunteers include community residents, area business representatives, educational staff at UAA, Garden Club, Sleeping Lady Mountain Lions, Alaska Military Youth Academy, Boy Scout Troops, Eagle River Boys & Girls Club & Chamber Ambassadors to keep this park in tip top shape offering a beautiful entrance into our business district. The Chief Alex Park has been working collaboratively working with a number of organizations for summer plans for the park. Scheduled is a dedication ceremony to honor our veterans. A Blue Star Marker will be placed in the park. A number of other changes have been submitted. Stay tuned for more information! At the park you will regularly find yoga and other exercise classes happening. 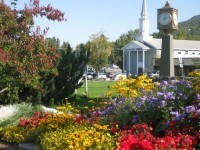 With its beautiful location, updated benches meeting ADA standards and well-kept lawn, the park is well loved and used!